You've advanced to the GSL finals at last. Tell us your thoughts. From Brood War up to now, I've spent about six years living life as a pro gamer. I'll have to win at the finals, of course, but it's already become a very meaningful day to me in itself. What thoughts ran through your head when Curious was confirmed as your opponent for the semifinals? I didn't care about whether I would face a Zerg or a Protoss. I might have had weak ZvZ before, but I gained a lot of skill and got a better grasp of the matchup while practicing for the Ro4. I felt that I was at a high enough skill level that I would be able to win. In the first set, you made Hydralisks after seeing your opponent's Spire. It's difficult for someone to go for a Spire and double upgrades at the same time, and I'd been working on my upgrades anyway, so I decided to build up my strength through Hydras. I am a bit disappointed that I wasn't able to keep my third Hatchery, though. I was at a slight disadvantage, but I managed to shake up my opponent with a multi-pronged attack and inflict major damage. Why did you produce Hydralisks instead of Infestors? If you upgrade from two Evolution Chambers, it's hard to gather the gas needed to make Infestors; that's why I felt that I should make Hydras. His Mutalisks would have been forced to turn back anyway if I attacked him with my main army. Even though the second set began with Ling-Bane, it ended up taking a similar course to the first. However, it was the other player who won with his build this time. It was a situation that I'd known of during practice, and I believed that I would have an advantage if I took a Lair before my opponent. I'd taken out a lot of Roaches and defended my Hatchery, so I'd already had the upper hand. But I don't know whether it was because I got overexcited, but I forgot Roach speed, and I also didn't make workers and macro up when I needed to. I think that Curious macroed well. You won on Whirlwind SE at the end of a base trade. I did fend off the first Mutalisk attack well, but I wasn't able to handle the Mutas once I was at three bases. I had to hit with a single blow. If you don't move your army out properly, it's easy to be attacked at the rear due to the Mutalisks. I should have turned back my Roaches to make sure, but I wasn't able to. I was able to win because my timing was good and because I'd saved my Drones. The game on Daybreak ended up being a long one. When did you spot Curious's Brood Lord composition? I saw my opponent going for a Hive and a Spire using Changelings from an Overseer at one corner, and I expected Brood Lords once my opponent began to build Spine Crawlers. I wanted to gather an army to go for one strong push, but it was tough because of the numerous paths on Daybreak. On Neo Planet S, you went for a Roach push using a Creep highway. It seemed that you had prepared this strategy in advance. It was EG's Revival who recommended the strategy to me, and it was effective when I tried it out. I'd already gone for double-upgraded Roaches previously, so I felt that changing up my strategy [This game began with Symbol building two Evo Chambers, too] would be good for tripping up my opponent. Curious's teammate, Life, goes for double Evo Chamber builds during his matches, so I thought this would make a good counter. I even decided to take the Spine Crawler along in advance, since it was going to be a one-shot attack anyway. It looked like you'd prepared your 4-Queen build during the sixth game on Akilon Flats from the start. That's true; it was a 4-Queen build with no gas. It was a strategy that HyuN-hyung had prepared and had also used during broadcasted games. I think it's an unbeatable build on Akilon Flats, so I asked HyuN-hyung about it and made use of it. Whom do you want to face in the upcoming final? I enjoy ZvT more than ZvZ and think that the spectators will agree with me, so I want to play against Terran. I actually haven't ever played any broadcasted games against TaeJa before. If I play as well as I do during practice, I think that the match could be an exciting one. What score are you expecting? I'm not the type to predict scores in advance; I tell myself off when I think like that. I do have to win, but I don't think that the score matters. This is the last Wings of Liberty GSL final. People have said that ZvT is the most entertaining matchup, so what kind of match do you think would unfold? I think that if things go well, the games will become macro battles. If the match becomes a ZvT, I will show you macro games at the very end [of Wings of Liberty]. I feel that the games are going to be cutthroat. You've said that you've helped TaeJa practice. Did you maybe show too much to him during that time? Well, TaeJa showed me a lot, too. There are still a lot of strategies that I haven't revealed yet. RorO could also possibly rise up to the finals. I think that RorO is in the top three out of the KeSPA Zergs. If RorO reaches the final, I think that like Curious, he'll be tough to defeat. But I prepared a lot for ZvZ during the semifinals, so I feel confident even if RorO makes it up. With your advancement to the finals, you'll have even less time to practice Heart of the Swarm. I think I'll start practicing HotS after the final. As for the IPL, which uses Wings of Liberty, I'll rely on my fundamentals. Let's speak in more detail on the media day. Do you have any last words? First of all, I want to send my thanks to my manager and my coaches. I'm really happy that I was able to reach the finals after I joined AZUBU. I want to thank my parents as well as my sister and her husband for looking over me and rooting for me. I'm thankful to LosirA, Revival, Savage, and my AZUBU teammates for helping me during practice. I feel that my time on TSL still remains a part of me; I think my good results right now are because of my TSL teammates' help back then. I definitely have to give my thanks to Lee Woon-jae, former TSL manager, and Kim Ga-ram, former TSL coach. I've said this before, but I will prove that TSL Zergs are the best. The advice that HyuN gives me whenever I play a match is of great help to me; it sounds like I'm joking when I say things like "He bestowed favors upon me" or "He is my instructor", but I do sincerely feel like that. I want him to know that I'm extremely grateful to him. I'll manage what time I have left to show people the best of my abilities and take the championship. :D Was waiting for the interview, then suddenly I see this wondering why LR thread is in general. Great interview; thanks for translating. Sad that Curious didn't make it, but I find Symbol quite likeable and this interview most certainly put him in a good light. I hope he wins the finals. Seeker must be flipping out about the title right now behind his computer screen. When do they think that a 4-queen gasless build is better than a 2 queen gas build ? What are the conditions they use one build instead of another ? Since he specifically mention Akilon flats, I assume it has to do with the map. Maybe having just 4 queens on that map will allow him to defend against early aggression and he can drone up quicker? If they used the same build every time, then the opponent would have a build catered directly to that one so variation must occur otherwise an enemy can just get a build order win. Who was he in BW? Thanks for translating. Glad that Symbol made it. As in Neel before Jaedong Oz. that was a great interview. GL to Symbol. if he plays vs Taeja then i'll root for him, else i don't really care as i like RorO! I'm so happy Symbol finally made it, especially through facing some of the best players in the scene when people were calling Symbol a "patchzerg" or washed up. I'm glad that TSL is still alive in spirit despite the team disbanding, and it shows that a team is not the sum of it's sponsors or structure, but of the players and coaches. I love these interviews. They are the only thing that can take my lack of caring into genuine appreciation for the player and the hard work he has into perfecting his craft. I don't know why but I just get the feeling that Symbol deserved this win way more than Curious did. Way to go, and I hope it is indeed Taeja in the finals so we can end WoL in epic TvZ fashion. Do HyuN proud and win the final symbol. 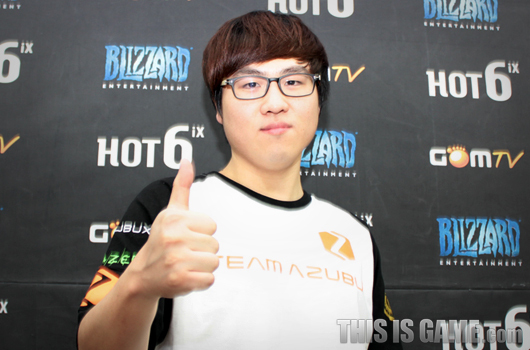 Unless it's against TaeJa, because heh, Terran.